Photograph by Richard Drew: "This is now it affected peoples' lives at the time." My cell phone went off at the same time, and the office said we were going to can this fashion show. I put my stuff back in my bag and walked to Seventh Avenue, just a block away, and caught the number 2 or number 3 express subway train and got out at the Chambers Street stop, which is just before the World Trade Center. By that time, the second airplane had hit. I worked my way west, because I wanted to be away from the smoke, upwind from the smoke and fire, avoiding whatever blockades the police put up. I didn’t even pull out my press card; I just wandered with the rest of the crowd. There were policemen with the hard hats on, and they were trying to get me out of the street. They said, “You have to go to the other side of West Street,” and I said that’s fine—it gave me a better vantage point. I was standing next to the ambulances, the triage unit, where all the rescue people were. I figured if there were people hurt, they were going to come there, and usually I find that the ambulance people and the rescue people don’t care if you’re there. So I hung with them, and I was standing next to a very nice policeman from the 13th precinct, and all of a sudden he said, “Oh my gosh, look at that!” I looked up, and there were people coming out of the building. I was photographing them as they were coming down. We were watching one guy who was actually clinging to the outside of the building. He had a white shirt on. We were watching him for the longest time while all these other people were falling. Then there was the huge rumbling sound. I had my 80-200mm lens on, and this rubble just starts to fall down. I had no idea it was the building falling. I though maybe it was part of the roof or the façade. I was at the northwest corner of the North Tower. It was the South Tower that was coming down. I made six or eight frames of that before I was yanked by some rescue person yelling, “We’ve got to get out of here!” And I was being pulled up Vesey Street. We’ve all seen the clouds; we were all caught up in that. It was really tough to see [and] tough to work, because you couldn’t breathe. I managed to get to an ambulance and to get a surgical mask. I went over to the spot where they were moving all the ambulances, about a block and a half from [my] original location, and I was photographing people walking out, covered with ash. Then a police officer in a white shirt came running up the street, yelling, “We all have to get out of here!” I was thinking, “They are just trying to clear the area.” I changed lenses, to a medium telephoto lens, and thought, “If they are going to kick me out, I am going to make some more pictures of this building on fire, then leave.” As I picked my camera up to do this, the top of the second tower poofed out. I held my finger on the trigger and made nine frames of this building—the North Tower—cascading down. I said, “I’ve got to get out of here,” and I ran a block and a half north to Stuyvesant High School. The students were being evacuated. They were all in the lobby; I was in with them. They went out of the north end of the school, as I did—north on West Street. I went back around to where all the people were, covered with dust and debris. I went home about nine o’clock that night, and then turned around the next morning and got up early to be down at Ground Zero. The third day is when it got to me emotionally. You know, you build up adrenaline. The camera is a real filter. The camera separates you from reality, but this time it really got to me. I decided I wanted to go someplace else to try another part of the story, and I went to where the families were trying to find the lost. There were not a lot of people there. I went around the corner to get a cup of coffee, and my phone rang. It was my three-and-a-half-year-old daughter. She says, “Daddy, I just want to tell you that I love you,” and I guess that really got to me, because I realized there are lots of people out there who are not going to hear their three-and-a-half-year-olds say, “Daddy, I love you” any more. I had to take two days off after that. 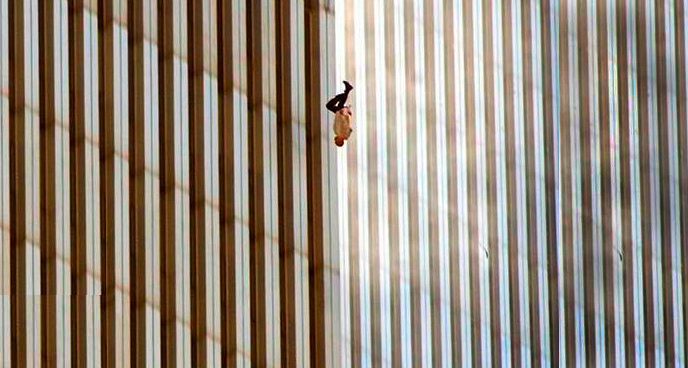 The one image that’s been causing a lot of discussion is one I shot of a man falling headfirst from the building, before the buildings fell down. There are two newspapers that have had their ombudsmen write stories about the picture, explaining why they used the photograph: the Memphis Commercial Appeal and the Fort Worth Star-Telegram. They received a lot of complaints [from readers]. Our readers emailed and phoned and complained that they didn’t want to see this over their morning cornflakes. I think [the picture] disturbed readers the way that Nick Ut’s picture of the little girl burned by napalm in Vietnam did, or Eddie Adams’s shot of the police chief executing the guy in Saigon did, or John Filo’s picture of the girl bending over the student killed at Kent State. These were all images that had disturbed people along the way. [The picture represents] a very important part of this story. It wasn’t just a building falling down; there were people involved in this—this is how it affected people’s lives at that time, and I think that is why that is an important picture.